M. Eugene Boring is I. Wylie Briscoe Professor Emeritus of New Testament at Brite Divinity School, Texas Christian University. He is the author or editor of numerous books relating to New Testament Studies, including, An Introduction to the New Testament: History, Literature, Theology, as well as Mark: A Commentary from the acclaimed New Testament Library series, and Revelation: A commentary for Teaching and Preaching from the best-selling Interpretation Commentary series. 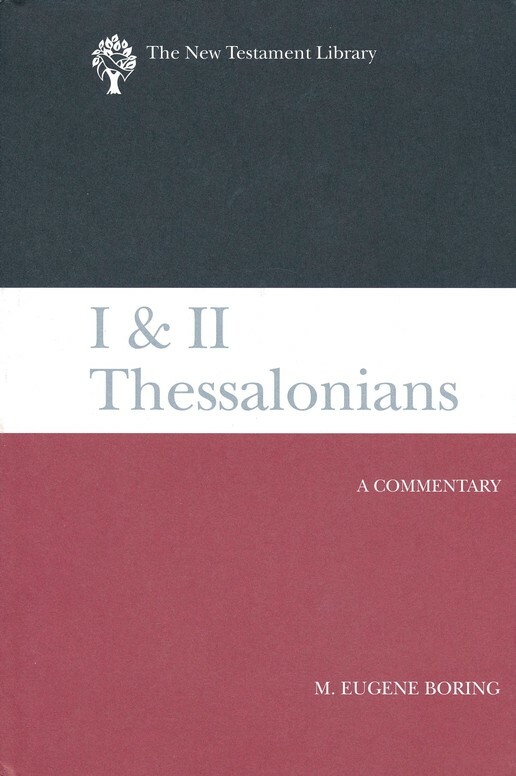 Most recently, Boring has offered this present contribution, another advantageous volume added to the New Testament Library series: I & II Thessalonians: A Commentary. Boring is a well-respected scholar and this volume on I & II Thessalonians displays that very clearly. The commentary begins with a substantial bibliography of up-to-date commentaries, monographs, books, and essays related to I & II Thessalonians. At 22 pages, one could easily call it comprehensive and complete, but Boring himself points readers to An Annotated Bibliography of 1 and 2 Thessalonians (Brill, 1998) by Jeffery A. D. Weima and Stanley E. Porter for a more complete list up to 1998. Subsequently, Boring provides an engaging introduction, bring the reader into the word the Thessalonians. Boring describes in length the historical setting, such as the city, religious life in Thessalonica, Paul’s ministry to the Thessalonians, and the conflicts, troubles, distresses, and persecutions. The commentary itself is wrought with exegetical and theological insight. Each section of text in the commentary is based on Boring’s original translation of the Greek—a textual basis of which he describes thoroughly in the introduction. Moreover, the reader will be excited and surprised by the lengthy exegetical and explanatory footnotes that accompany Boring’s translation. Personally, I found Boring’s translation to be extremely helpful in light of the commentary that followed. The commentary itself is thoroughly researched and seasoned with Boring’s awareness of the cultural context of the Thessalonians and Paul’s engagement therein. Boring’s commentary on II Thessalonians may come as a shock to some readers not familiar with the underlying discussions surrounding Pauline authorship. Boring writes under the conviction that Paul did not write II Thessalonians, and his introduction to II Thessalonians provides the reader with one of the most concise and comprehensive summaries from this position available. This presupposition is carried consistently throughout the commentary. Many will undoubtedly find Boring’s critical approach to the letter unsettling and lacking support, but this should not differ the reader from engagement. Rather the opposite. Boring presents some the most complete and up-to-date critical engagement with II Thessalonians, and because of this he rightly deserves a place on everyone’s shelf. I & II Thessalonians: A Commentary is an up-to-date examination of two very important Pauline epistles. M. Eugene Boring has provided a well-researched presentation of the current conversation among New Testament scholars. Boring’s translation and translation notes are indispensable and his bibliography is thorough. The introductory engagement is superb and the textual commentary is consistently strong throughout. If you are looking for a strong commentary on I & II Thessalonians from a critical perspective, then Boring has provided you with a commentary that cannot be overlooked.